Over the last 25 years, various generations of "The Christmas Truck" have brightened the holiday season, figuratively and blindingly literally, for residents of Central Iowa. Here's the story of the virgin birth of this brilliant piece of low-tech yuletide celebration. Like Isaac Newton and gravity, The Christmas Truck was the results of one man's sudden inspiration. Kris Marshall was hauling a generator and a few strands of Christmas lights to his church in a $50 used truck. He simply combined the two and The Christmas Truck was born. It's amazingly nontechnical, it's literally just lights taped to a truck. According to Marshall "It's not very scientific, it's a hideous site in the daylight, there's black tape and wires in the daytime." But at night it's amazing. Marshall has used eight trucks and added dozens of strand since, though it's always a 2WD Chevy/GMC with a regular cab and eight-foot truck bed "the way a truck ought to look." By his own estimate there are 50-to-70 strings with a mixture of 50 and 100 lights each, making a conservative estimate of 3,000 lights. There are no LEDs, just the cheap $0.89 strings, though he'd like to add some to take pressure off the taxed generator. It's a hit around Dallas and Polk Counties in Iowa, where Marshall is a GMC truck salesman. He often pulls hayrides and drives in parades around the holiday seasons. Unfortunately, not all police officers understand. "It's totally illegal and almost all the cops are cool with that. Almost all... some of them don't get it. Last night I met two cops in four minutes and they just smiled. I think I've got most of them trained." 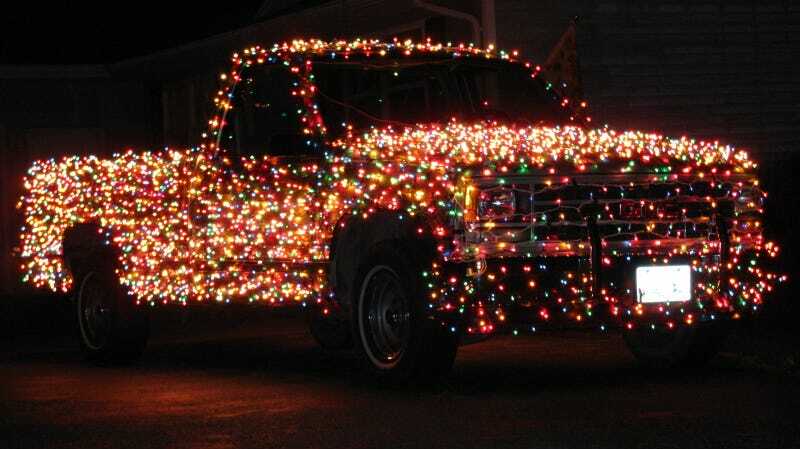 With the exception of a few tickets for illegal use of lights, the only other downside to The Christmas Truck is when one of his sons decides to use it for a date. "If you're picking up your girlfriend in the Christmas truck and she's not expecting the Christmas Truck that can be a dealbreaker." We salute Kris Marshall for a display of holiday exuberance high on awesome but appropriately low on ingenuity for someone who thinks a working heater in a truck is "a luxury."